Recently, a group of old friends and I headed to Cabo San Lucas, Mexico for some sun. We had such a good time that there has been talk of taking another trip together. While I would have no problem heading back to Cabo with this awesome group, I thought it might be fun to explore other options for next time. I've also been spending some time researching the Hyatt Gold Passport Rewards Program and How to Always Get 10-15% off Hyatt Hotels. This post will explain how to stack both opportunities for a ridiculously good deal in Cartagena, Colombia! Why Cartagena for the Next Trip? Flights on Avianca (read: nice, new airplanes) from LAX, often for similar prices to other places with tropical weather like Cabo or Cancun in Mexico. Cartagena feels adventurous compared to more typical US leisure destinations, but enough Americans go that it sufficiently caters to that crowd, too. Colombia is a discount destination, where most things cost half what they'd cost in the United States. A 15-20 minutes taxi ride costs about $5 and a full meal with drinks at a restaurant can be had for $5-15 per person. Even drinks at trendy nightclubs will only set you back a couple bucks! Speaking of clubs, Cartagena has a great nightlife scene, whether you want to dance or chill on a rooftop with some beers. There's enough to explore during the day, too, so no need to hang by the pool the whole time (though that sounds good!). Right now, there is an absolute steal of a hotel award redemption at the Hyatt Regency! This hotel is so new, it isn't even open yet! The Hyatt Regency Cartagena in Barrio Bocagrande is currently taking reservations for December 19th, 2016 and on. From the photos available and information I was able to gather from the website, this is a premium hotel, but somehow it's only a Category 2 redemption for Hyatt Gold Passport members (more on why this is awesome later). 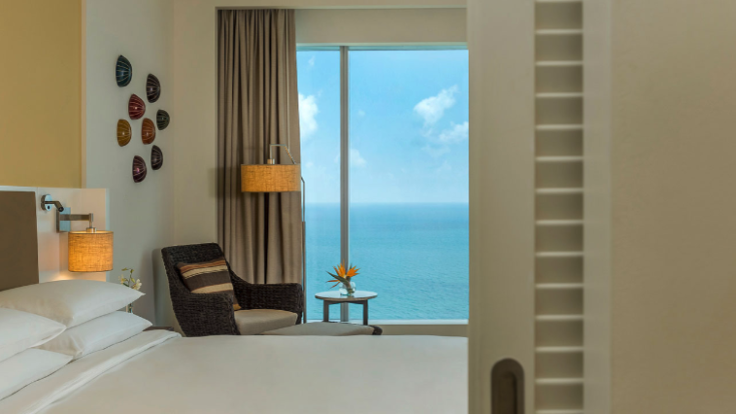 The Hyatt Regency is located just a three minute taxi ride from the main Cartagena action (Centro & Getsemani Neighborhoods) in an area populated by long strands of beach-front, high-rise hotels. Bocagrande is often spoken of as the "Colombian Miami Beach," although the beaches themselves aren't quite as nice. Colombia is a little farther than Caribbean destinations and significantly farther than Pacific Mexican resort towns, so I think 5 days (including the travel days) is the minimum. Since 5 days is the minimum optimal trip length, I decided to focus on weekends that also fall on US national holidays to reduce time-off work. What I found is that typical Los Angeles-Cartagena roundtrip prices for dates associated with US three-day weekends are approximately $525-$550. Both sample dates involve the same flights from LAX to Bogota, but I changed the leg from Bogota to Cartagena in the second to show what's possible with an overnight in Bogota. Basically, by continuing to Cartagena the following day, we'd have time to go out and see the nightlife in Bogota instead of arriving in Cartagena at midnight and trying to force a late start to the evening there. This is effectively a two-for-one deal on Colombian cities! The cheapest flight currently available to Cabo on an airline that is not known for crazy add-on fees and screwing up people's travel plans (I'm looking at you, Frontier!) is this Delta flight for $570 roundtrip. Basically, three-day US holiday weekends are out, since Cabo is priced for these...they know when we want to come. Interjet will fly to Cancun for $460, which is a pretty good fare, considering that's nearly 5 hours of flying. However, at that point, the difference in cost between Cancun and Cartagena is less than $100, so Mexico really isn't that much of a flight bargain compared to Colombia. At that point, getting to visit the more exotic destination is probably worth the extra money. Hyatt allows members to book award stays with a combination of points and cash, which is what was going on in Option 2. This keeps the hotel cost very minimal at $27.50 per person, per day while requiring half as many Hyatt points to execute. Option 3 is just a variation of the previous option that adds a 3,000-point upgrade to "Club Level." The Club Level rooms are bigger, with better views and on higher floors, but perhaps the most significant benefit is free continental breakfast and "social hour" in the club lounge (read: free booze every afternoon). In Cabo, we really appreciated not having to go out to get breakfast and it was nice to get a good buzz "on the house." The big difference here is that each day we paid about $125 per person for those privileges plus the room in Cabo, whereas here it costs only $27.50 + 3,500 Hyatt points per person. How good a deal is this? Best available room rates for this hotel start at $160 per night ($200 for club-level) and head north of $350 in high season and popular weekends. If just one of us picked up the Chase Sapphire Reserve credit card, the sign-up bonus plus a little spend would earn enough Chase points to transfer to 120,000 Hyatt points. That man would be an absolute hero and the group could take care of him by buying his food and drinks when we go out! That would leave us with a $1,500 hotel bill, split 20 ways. Bogota Party Bus Tours could be fun for a group! For about $675, airfare and lodging for a 5-day trip to Colombia would be covered. Those who made Cabo a 5-day trip spent about $850 ($500+ for lodging, $350+ for airfare, not including a canceled flight fiasco that left several folks stranded another night). Since our hotel in Cabo was all-inclusive, we have to factor in several days of food/drink expenses, but we'd have an extra $175 each to work with and it would be easy to eat and drink lavishly for less than that amount in Colombia. In short, a trip to Cartagena would be equally affordable to a return to Cabo or another Mexican destination, while providing the opportunity to experience something new together! Do you want to take a vacation like this with your friends, but need some help planning the trip? Click the Travel Consulting tab at the top of this site to learn how I can be of service!